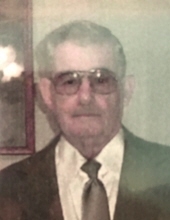 Ernest (Ernie) V. Hiatt, 85, of Martinsville, VA passed away early Monday morning, April 8th, 2019. He was born to the late Ed Lee Hiatt and Leora Hiatt. In addition to his parents, he was preceded in death by his beloved wife, Janie V. Mitchell Hiatt; and a daughter, Teresa L. Watkins. Ernie was an avid hunter and conservationist who respected the value of nature and the benefits we all gain by sharing that respect. In Martinsville circles Ernie was also a well-known baseball and softball player and coach who loved the game and the opportunities it presented. He is survived by a brother, Jack Hiatt and sister, Alice Saunders; a son, Jerry Hiatt and his wife Liz; grandchildren, Ashley Wlodarczyk, Regan Hiatt-Sherman, Brittany Hiatt-Korsh, Morgan Hiatt, and Gregory Watkins; and 5 great-grandchildren. His example of continually striving to increase his education is an example for us all. In mid-career he completed his GED, earned a Virginia Master Plumber’s license, and achieved a state Wastewater Operator’s license. A funeral service will be held at 11 a.m. on Wednesday, April 10, 2019 at Norris Funeral Services, Martinsville Chapel. The family will receive friends one hour prior to the service from 10 a.m. to 11 a.m. Burial will follow at Roselawn Burial Park. Norris Funeral Services, Inc. and Crematory, Martinsville, VA is serving the Hiatt family. To send flowers or a remembrance gift to the family of Ernest Vester Hiatt, please visit our Tribute Store. "Email Address" would like to share the life celebration of Ernest Vester Hiatt. Click on the "link" to go to share a favorite memory or leave a condolence message for the family.